According to a recent news article from The Boston Globe, Massachusetts Bay Area Transportation Authority (MBTA) Transit Police alleged that a 55-year-old suspect hit a Transit Police cruiser in South Boston. The accident occurred around 7 p.m. on a Thursday evening, when suspect was allegedly driving his Ford pickup truck. Police say the officer who was operating the cruiser that suspect allegedly sideswiped, immediately began chasing the suspect, and was able to pull him over shortly after the motor vehicle accident. The officer pulled suspect over on the corner of A Street and West Broadway in South Boston. 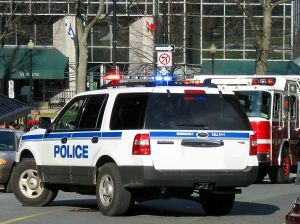 Officers further allege that, while conducting their traffic stop, they recognized defendant to be intoxicated and ultimately arrested him for operating a motor vehicle under the influence of intoxicating liquor (OUI), operating a motor vehicle without a license and leaving the scene of a traffic accident (hit-and-run). As our Boston drunk driving accident attorneys can explain, car accidents in which the defendant did not have a valid driver’s license may be considerably more complex than cases in which defendant had a valid license to drive. The reason for this is that someone who does not have a driver’s license is likely to be driving a car that is not insured. While it is possible defendant was burrowing another person’s car that did have liability insurance, this is certainly an exception to the norm since most people to do lend their cars to unlicensed drivers. The reason this makes the matter more complex is that an at-fault driver’s car insurance policy is normally the primary source of funding from which plaintiff can recover following a settlement or jury verdict, should the case go to trial. If a defendant does not have a driver’s license, and therefore does not have car insurance, your car accident lawyer will have to look at other sources from you can financially recover. One of these possible sources following an accident with an uninsured defendant is known as uninsured motorist coverage (UM). UM is insurance coverage purchased by car owners to compensate them in the event of a crash with an uninsured motorist. Even if you have never heard of UM insurance company, if you own a car that is registered in the Commonwealth of Massachusetts, you have it. This is because the law requires that every insurance company which underwrites motor vehicle liability insurance in the Commonwealth must provide a UM coverage along with any policy sold with limits matching the limits of the rest of the policy. Additionally, it is not necessary that you be in the car you own at the time of the accident. The fact that you have UM coverage may be enough, even if your car was sitting in your driveway at the time you were injured. However, it should be noted that just because you have a policy with your own insurance company does not mean they will honor your claim and make a reasonable offer. Insurance companies do not generally treat their own customers better than anyone else in UM situations, so your experienced car accident lawyer may have to fight for your rights to a full and appropriate recovery.